Сервисом alaTest было собрано и проанализировано 117 обзоров для Acer Chromebox CXI. Средняя оценка этого товара 4.3/5, в сравнении со средней оценкой 4.1/5 для других Настольные компьютеры. Мнения о дизайне и размере в целом положительные, дизайн и размер также получили хорошие отзывы. Мы проанализировали оценки экспертов и пользователей, дату выпуска продукта и другие факторы. По сравнению с другими товарами из категории Настольные компьютеры, Acer Chromebox CXI получил alaScore™ 93/100 = Отличное качество! The Acer Chromebox CXI-i38GKM packs a Intel Core i3 processor and 8GB of RAM, which is great for video conferencing, but makes it's too expensive for a Chrome-based desktop. Decent feature set. Includes keyboard and mouse, as well as stand and mounting bracket. Performance is enhanced with an Intel Core i3-4030U processor. Only 16GB of local storage. Pricey for a Chromebox. The Acer Chromebox CXI-4GKM is a good pick for casual Web-focused users who don't need a full Windows desktop. Solid performance. Decent feature set. Includes keyboard and mouse, as well as stand and mounting bracket. Limited local storage. Relatively more expensive than competitors. The Acer Chromebox CXI can turn any monitor or HDTV into a capable cloud-based computer. 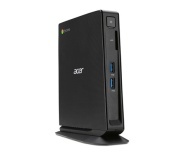 The Acer Chromebox CXI3 is an excellent mini PC that runs Google's Chrome operating system. But even with a solid design and great performance, it's a lot to pay for a limited desktop experience. I have reviewed several Chromebooks before, they are small laptops running the Chrome operating system. This however was the first Chromebox I have reviewed it is a full featured PC all you need to add is a panel via HDMI or DisplayPort. The Acer ChromeBox CXI combines a few worlds: PC, ChromeCast and Chrome OS. It does so elegantly. The only thing that may go against it could be the price. However, you get a lot for your money. El Acer Chromebox CXI es un ordenador de sobremesa con un formato portátil y el sistema operativo Chrome OS, pensado para ofrecer una plataforma competitiva sin hacer una gran inversión.